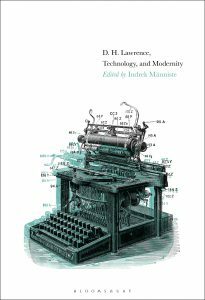 Indrek Männiste answers a few questions about the new edited collection D. H. Lawrence, Technology, and Modernity. It is a book about the literary legacy of D. H. Lawrence and how he tried – throughout his life and work – cope with the emerging technological age. D. H. Lawrence has often been seen as a fierce critic of industrialism but until now there has been no unified and specialized body of work dealing directly with the subject. I felt that there was a genuine need for these specifically focused readings of Lawrence’s works. Several prominent Lawrence scholars have admitted that even only a few years ago, a volume on Lawrence and technology could barely have been imagined within Lawrentiana. I truly hope that this book paves the way for many and even more nuanced studies to come on the subject. Since we live in the technological age, understanding what drives it and how it changes us is a challenge we inevitably must face. The work leading to this particular volume took about two or three years but D. H. Lawrence as a fascinating, albeit controversial, author has interested me almost a decade. I have a background in philosophy and in Martin Heidegger’s philosophy of technology in particular. Combining philosophical and literary responses in exploring technology has always seemed to me as a very natural and balanced approach: it connects life as seen and lived through literary lens with the everlasting quest for truth. Most of the critical work in this book is rather original. For example, nobody has written about Lawrence and robots before as Tina Ferris does in her chapter. Also, several other chapters explore themes that have not been studied in great length such as Lawrence and war, Lawrence and film, Lawrence and counterpoint, and many, many others. I have a long-standing relationship with Bloomsbury and Literary Studies. Since I had published in the series previously, it was only natural that I offer my new work to be published in this wonderful series again. Indrek Männiste is Researcher and Lecturer of Philosophy of Literature at the University of Tartu, Estonia, and author of Henry Miller: The Inhuman Artist: A Philosophical Inquiry (Bloomsbury, 2013). He is the editor of D. H. Lawrence, Technology, and Modernity, now available from Bloomsbury.